The T-Shirt Company has embraced the beautiful art of embroidered textiles. We've added a brand new multi-head embroidery machine to our arsenal for 2017. If you want an alternative or an addition to screen printing for your next project this just may be it. Behold, the wonder of Embroidery Dublin and while you're here behold the wonder of Dublin's finest embroiders. Yes, the T-Shirt Company have spent many the year supplying the good people of Ireland with superbly crafted screen printed goodies but as everyone knows we don't do things by half here. So we knocked down another wall for some space and got ourselves a TAJIMA TFMX-IIC1502 multihead machine. We provide custom embroidered jackets, hoodies, hats, shirts and logos. Thousands of threads being sewed at a thunderous rate, to think that they used to do this by hand in centuries gone by. Well, they clearly didn't have a TAJIMA TFMX-IIC1502 multi-head machine. 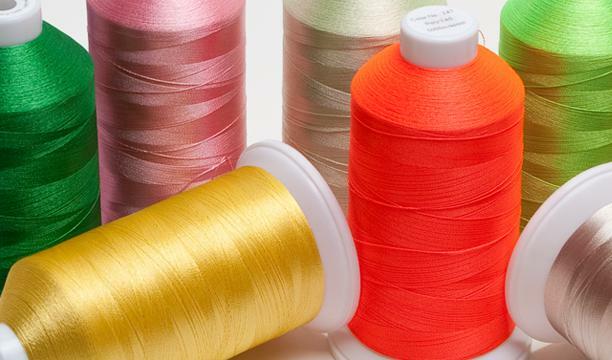 For faster production runs, more consistent stitching, higher design quality and reduced setup times, TAJIMA commercial machines are the most efficient and reliable embroidery equipment in the world today. At times an embroidered finish is a more suitable solution to screen printing. It can often convey a sense of tactile quality which may add value to a product. The polo t-shirt for example is often worn at corporate functions and an embroidered crest logo exudes casual but stylish professionalism. 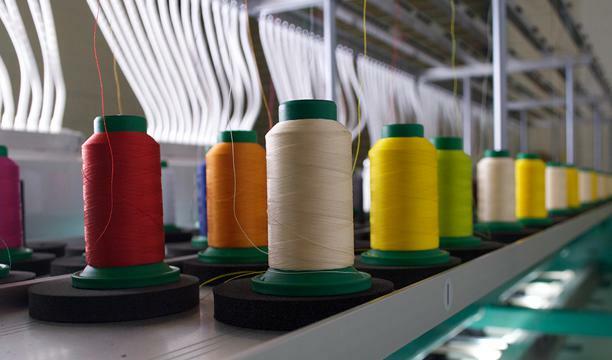 Embroidery is also used for branding outdoor workwear due to its physical durability and smart professional appearance. At times price can play a role in your decision whether to go with embroidery or screen printing for your gear. With screen printing large amounts of colours can become costly on smaller runs. However the number of colours in an embroidered design does not affect the cost. We endeavour to stitch our embroidered logos with as much density as the fabric will allow in order to produce the highest standards. The first step in the embroidery process is to digitise your artwork. The graphic is created using specialised software. This program plots a pathway for the machines needles to follow and also lets the machine know when colour threads need to change. Your design is created within two points of X and Y known as a 'field' that is digitised on a disc. X being the horizontal axis and Y being the vertical axis. These axes serve as a coordinates map for the design which are then entered into the multi-head machine. The garment is fixed to the machine in a framed holder named a phantogram. 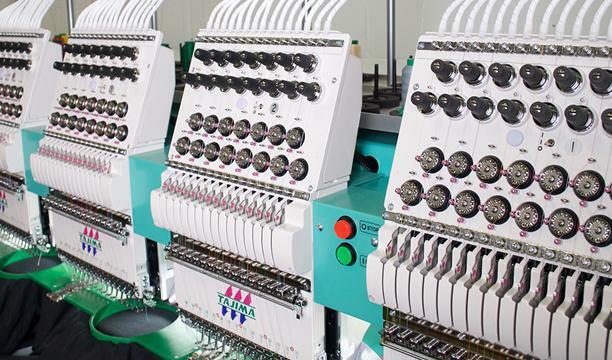 The machine is sent the design coordinates and moves the phantogram accordingly for the garment to receive the appropriate colour and number of stitches. The programmed path for the design is followed and stitched until the entire graphic has been successfully sewn. The garment is then removed from the machine, folded and packaged accordingly for you, the customer.